Ruth Ware is quickly becoming one of my go-to, will-never-disappoint authors. I know I will enjoy whatever she writes because her books always pull me in and wrap me up in their suspenseful psychological messes. Bonus: the narrator for both of her books that I listened to was thoroughly engaging. The Lying Game tells the twisted, complicated story of four young girls who met at Salten, a boarding school near the cliffs of the English Channel. Fatima, Thea, Isabel, and Kate helped each other navigate the murky waters of this boarding school during their teenage years. Their friendship was so strong that no matter what happened, they each knew that the other three girls would have their back. These girls became inseparable and solidified their reputations as untouchable and the ‘bad girls’ with the invention of the lying game. 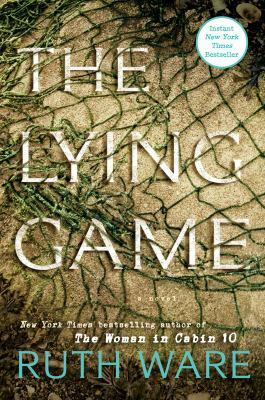 The lying game may have started out harmless, but quickly grew out of control as the girls’ abilities to keep their lies and truths straight deteriorated. The number one rule of the lying game: don’t lie to the other players. That rule became more and more difficult to follow the longer the game went on, something that had the possibility to destroy all of their lives. After leaving abruptly in the middle of the school year, all four friends find themselves thrust back into the regular world without a clue what to do. Fatima, Thea, Kate, and Isabel have woven a complicated, messy relationship that none of them can escape. Each will still drop whatever they are doing to come to the rescue of the other, even though many years have passed. One morning in June, the four friends’ lives begin to unravel. Human remains are discovered near Salten by a woman walking her dog next to a tidal estuary. The discovery of the body shocks this peaceful town out of its idyllic reverie. Fatima, Thea, and Isabel soon find themselves thrust back into Salten life when they receive a distressing text from Kate saying that she needs them. Arriving back into town, the four’s shared past bursts to the surface and their realities come crashing down. A shared secret has the ability to destroy their current lives as well as drastically change their pasts. Unless you’ve been living inside a red and white ball, you’ve probably heard of Pokémon Go. 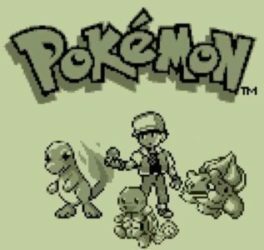 The original Pokémon RPG (role-playing game) video game was released way back in the ancient times of 1996. Beginning as a game for the original Game Boy, it quickly expanded into card trading games, TV shows, movies, more video games, and even a Monopoly board game. So what the heck is/are Pokémon? The name is a combination of the words “pocket monster.” Players – called “trainers” – find and collect wild Pokémon, and help them evolve into new Pokémon. Trainers also battle their Pokémon, using their Pokémon’s unique characteristics, gaining experience points, to become Gym Leaders and ultimately, the chance to become a tournament champion. 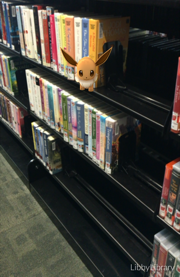 Eevee in the large print section! It’s a game that you can play on your phone or other mobile device that places you (via your avatar) within the game based on your location, superimposing the game world onto the real world. The company that created Pokémon Go used location data (landmarks, photos, etc.) from another of their games, Ingress, to create the world within the game. So, if you happen to be standing outside Davenport Public Library Eastern Branch, then that’s where you are in the game. Why are all these people standing around outside staring at their phones? It’s a little creepy. That’s the augmented reality part of the game. While you see people glued to their phones in an empty field, outside a building, or wherever, they’re actually experiencing the location within the game. Lots of public places have been made into important locations in the game (more on that later). Players must be within a certain distance to interact with whatever is at the location. And since the game is so popular, some locations have experienced very high traffic. For some businesses (and libraries!) this has been a boon. For other locations, not so much. Just be glad you’re not this guy. It’s true that there have been some horror stories – true and not – about people getting hurt, lost, or finding some terrible things while tracking Pokémon. The most important thing to remember when playing is to pay attention to your surroundings. Believe me, it can be hard. But, the game offers vibration and sound alerts so you can keep your phone in your pocket while you walk. USE THEM – or be eaten by Gyarados! And it should go without saying, don’t play and drive. Not exactly. The concern is that players who created their accounts by linking their Google/Gmail accounts were granting very broad access to their accounts. That has since been fixed, but if you’re still concerned, sign up with a Pokémon Trainer Club ID – it takes a little longer, but you won’t have to worry. Do I really have to walk? Yup – that’s the “go” in Pokémon Go! If you want to get cool new Pokémon and hatch eggs you will be walking. The game can tell the difference between riding in a car or even biking fast. But it’s a good thing! You get to experience new places you might never have seen before! Meet new people! Exercise! Unless you have a Roomba, a turntable or a cooperative pet, that is. OK, so how to I start? Firstly, down the game from the App Store or Google Play. Once it’s up and running, sign in using you Google ID, or get a Trainer Club ID. When you choose your trainer name and appearance, be careful! You CANNOT change either after you confirm! UPDATE 7/31/16 – An update for Pokémon Go! (1.1.0) now allows trainers to change the appearance of their avatars! After Prof. Willow’s introduction, you’re dropped into a fairly sparse map. Your surroundings should reflect major aspects in your surroundings, like roads, rivers/lakes, buildings and so on. On the screen, you’ll see what looks like green confetti or leaves nearby. Those are Pokémon! Once you get close enough (your trainer’s radius is the pulsing purple circle around you) the Pokémon will reveal themselves. Tap on them, and you’ll go mano a Pokémon. Tossing the Poké Ball correctly takes some practice. If you find the “virtual reality” setting too distracting, you can turn it off by sliding the AR switch at the top. The higher the Pokémon’s CP (combat points) the more difficult it will be to catch. The rings around the Pokémon will give some idea how where and when to toss the Poké Ball. When it’s large and green, toss! Yellow rings mean it will be more tricky, and orange even more so. Pokémon with higher CP (100+) will often break out of the Poké Ball and you’ll have to catch them again. Sometimes, they’ll grow weary of your attempts and run away. Yes, once you catch one, it tries three times to get out. If they can’t escape, you get to keep them. That’s … a bit grim. 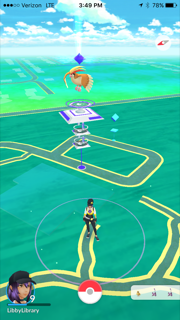 What’s up with PokéStops and Gyms? PokéStops are where you can pick up more Poké Balls, and an occasional bonus item, like reviving potion, eggs, razzberries and so on. PokéStops are usually located at some kind of landmark (although the term “landmark” is used loosely). You have to be within a certain distance to interact with them. Sometimes, you may see a PokéStop surrounded by pink confetti or petals. That means that some kind soul has set a lure and, hopefully, more Pokémon will come close enough to catch. Gyms are where trainers can pit their Pokémon against each other in battle to win the Gym, earn points and train up their Pokémon. You have to reach level 5 to enter and view a gym. What Team should I pick? That’s entirely up to you! If you have friends playing, you might want to choose the same team so that you can gain and keep control of Gyms. Or, if you live near a Gym that is consistently held by one team, you can join them and help defend it. How do I identify and keep track of all the Pokémon I’ve caught? In the game, tap on the Poké Ball icon, then tap “Pokémon” from there you can see the Pokémon that you’ve caught, see how much CP they have and evolve and power up. The Pokédex is like a Rolodex (GET IT?) for the Pokémon you’ve seen and collected. It gives descriptions, strengths and weaknesses and each Pokémon’s evolutionary pattern. Where are some places that I can go to catch Pokémon? The Davenport Public Library Main and Fairmount Branches are PokéStops , and Eastern Avenue is a PokéStop and a Gym. If you’re over 21, you can participate in the Quad Cities Pokémon Go Pub Crawl. According to David Heitz, the downtown Moline riverfront, Rock Island arts and entertainment district, the Village of East Davenport and Avenue of the Cities are good places to find Pokémon. In Davenport, Vander Veer Park is a very popular place! You can also check out the Pokémon Go QC Reddit for tips and maps. What about the tracking thing in the bottom right hand corner? That is supposed to tell you what Pokémon are in the area, and allow you track them. Unfortunately, the tracking feature does not work well. But it’s nice to see what’s in your vicinity. 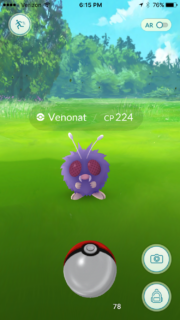 UPDATE 7/31/16 – An update for Pokémon Go! 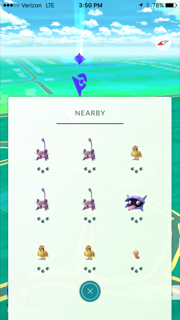 (1.1.0) has removed the footprints from the “Nearby” menu, presumably until they can get it work properly. What the heck do I do with all these Rattatas, Pidgeies, and Weedles!?! Even though it can get annoying, it’s worth it to keep collecting the common Pokémon. The more you have, the more candy and stardust you get (which you use to evolve your Pokémon). If you have too many, you can transfer them to Prof. Willow and get one Pokémon candy in return. The game isn’t working, and/or my battery is dead. Yeah, you’re not the only one. Pokémon Go has been plagued with slow and broken servers since it was released. It also uses up wireless bandwidth, so slow internet connections are also to blame. 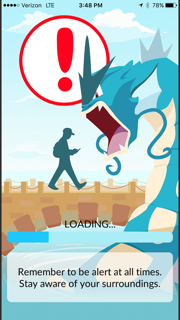 If you’re wondering if it’s you or the game server, try here: http://cmmcd.com/PokemonGo/. The game also has some battery saving settings, too. But remember that you must have the game open if you want alerts and to count your steps. Bring a charger! Anything else you’d like to know? Would you like to show off how awesome you are? Let us know in the comments! * I’m not an expert, but I am a librarian, playing as LibbyLibrary! Summer is my favorite time of year. School is out, the weather is getting warmer, summer reading programs begin, and the best part of summer starts: carnival time! Fairs, carnivals, and rodeos are my favorite way to spend a hot summer night with friends. Confession: I am not very good at carnival games. My hand-eye coordination is, to put it politely, lacking. This does not lessen my desire to play and actually makes me strive to become better every year. My newest way to practice, besides going to the arcade or setting up a mini-carnival with the kids in my neighborhood, is to play Carnival Games, a videogame available at the Davenport Public Library for the Wii. 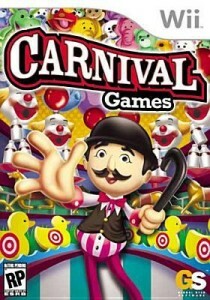 You may be wondering how playing a videogame actually prepares you to play real carnival games. The use of the Wii remote, instead of a regular game controller, allows players to practice the motion as they are throwing the sledgehammer to test their strength, as they are throwing the ball in Skee Ball, or even as they are trying to dunk someone at the dunk tank. One major bonus to this game is that it allows up to four players to play at a time, which makes each carnival game more of a competition, just like a real carnival! Carnival Games offers over 25 different games of chance and skill that can be found at carnivals across the nation. In addition to allowing players to customize and accessorize their own character, this game revels in the carnival spirit: with bright lights, patterns, and people of all kinds milling around the game. Check out this game today and play games like Balloon Darts, Ring Toss, Hole in One, Shooting Gallery, Meter-O-Love, and many more. And if you’re lucky, you will beat the rest of the people you are playing against and win one of the over 250 virtual prizes available. March Madness has descended upon us. For those of you not familiar with this, March Madness refers to the NCAA college men’s basketball tournament or the NCAA college women’s basketball tournament that both happen every spring. If your house is anything like mine, basketball has now taken over every television and computer screen. Videogame basketball is even happening! 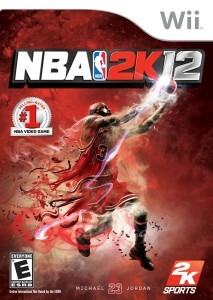 One of the favorites to be played in my house is NBA 2K12. The NBA 2K series lets you utilize real player rankings and press conferences to talk up the rankings of your player(ie. get more endorsements, money, and a better draft spot), learn who the famous players were that year and in previous years, and even learn more about how basketball statistics work. The 2K12 version of this game allows you to pick from the greatest NBA teams of all time and even lets you see the rosters, which show the players who were actually playing during that time. If you’re more interested in the current players, the previous years’ rosters have all been included as well. Don’t have a Wii and are looking for this game in a different platform? Or maybe you’re looking for a more up-to-date version of this game with more current players? If yes, then head to the library catalog and search “nba 2k*” and that will pull up results for the other versions of this game, (for example: NBA 2K13, NBA 2K14, and NBA 2K15), as well as different platforms: Wii, Playstation 3, Xbox 360, and Playstation 4. Any questions? Visit or call the library and our reference librarians call help you. Are you getting a little tired of the cold weather and looking for some new entertainment? Sometimes bundling up to go outside when it’s cold is just too much. I’d much rather stay home where it’s warm and have fun. Video games are my boredom/winter weather answer! One of my new favorites is Game Party. Game Party is a collection of classic skill games ranging from trivia, shuffle board, table hockey, and darts to skii ball, ping cup, and hoop shoot. 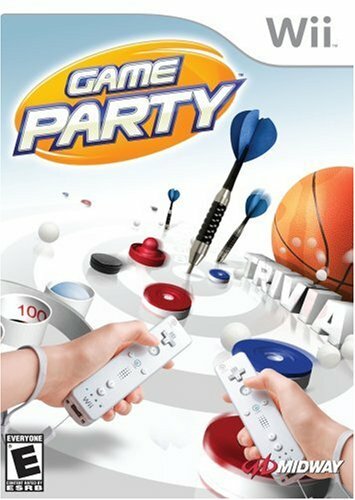 Because Game Party was released through the Wii platform, the Wii’s unique controls allow you to play those seven games just like you would in real life: flick your wrists to shoot a dart, extend your arms to shot a basketball, and practice your bowling motion to play skii ball. If competition is what you enjoy, never fear! Game Party allows you to participate in multi-player games, either by yourself or on a team, and even keep track of your progress on the leaderboard. Design your own player or pick from the ones Game Party offers. Break out Game Party and enjoy playing these seven classic games in their own natural settings from arcades, gymnasiums, traditional English pubs, and more. Game Party will allow you, your family, and friends the ability to compete and play without having to leave your house! November 16-22 is National Games and Puzzles Week. Try The Art of Chess by Colleen Schafroth. Have you ever needed help with a crossword clue? Try the Merriam Webster’s Crossword Puzzle Dictionary. Have you ever wanted to play a fast-paced video or computer game? 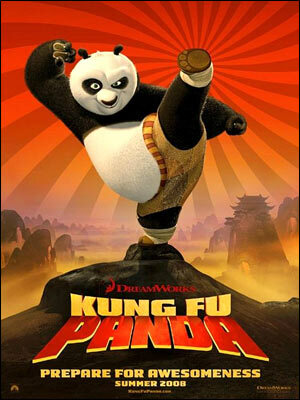 Try Kung Fu Panda or I SpyTreasure Hunt. Have you ever wanted to see if you are Mensa material, i.e., the top 2% of the population in I.Q.? Try The Mensa Genius ABC Quiz Book by Alan Stillson. Have you ever wanted to put a jigsaw puzzle together but didn’t want to go out and buy one? 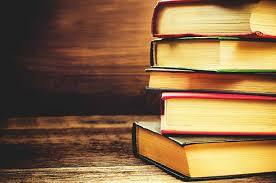 Try our collection at the Main Library. You can check out these 500-2000 piece puzzles just like a book! Where are they? You can find them the northeast corner of the first floor, behind the Reference section.